In the 1950s, the now diseased Danish archaeologist Jørgen Meldgaard made a mysterious discovery in northeastern Canada: A small, headless bear figurine, carved from a walrus tusk, was lying leaning up against the back wall of a stone fireplace in an old settlement. The bear had been positioned in a way that made it look as though it was ‘diving’ into the fireplace. At the time, this little figurine didn’t cause much of a stir. It was just one out of a long series of discoveries that Meldgaard made during his field trips to the Igloolik region of Arctic Canada and Greenland in the 1950s and 1960s. But when researchers at the Danish National Museum recently gained access to Meldgaard’s surviving diaries, records and photos, they realised that the discovery of the bear figurine was indeed quite sensational. The apparent fact that bears were regarded as something special could be because the bear, along with man, is one of the few animals that were believed to transcend and travel between the worlds of land and sea. Another explanation may be that humans and bears could change roles depending on the situation: sometimes it was the man who hunted the bear and sometimes it was vice versa. Meldgaard also found another bear figurine in a nearby settlement. This bear stood upright with its head sticking up and the body half buried in the gravel. Underneath it they found a fireplace, which suggests that this bear apparently was about to rise up from the fireplace. The combination of both of the bear figurines’ interaction with the fireplaces led the Odgaard to believe that this could be a sign of rituals. 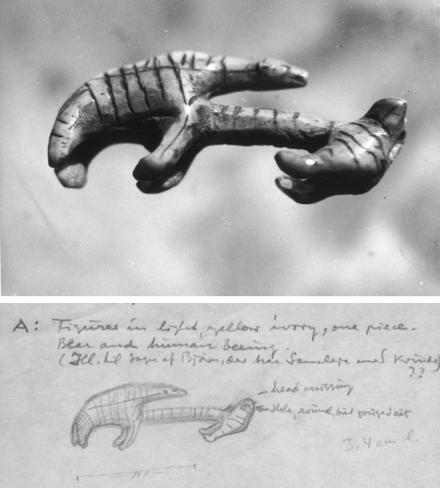 Carved bear figurines and the symbolism of rising and diving bears is also known in other parts of the world, for instance in Siberia, where resurrection rituals have been performed for millennia, says Odgaard. Here, the bear was the mythical ancestor that every year travels to the upper world to secure the liberation of the animals’ souls, so that humans again can hunt them. Legends from Siberia indicate that humans could communicate with the world of spirits through the fireplace. In other words, the fireplace may have been regarded as a gateway to other worlds. Bears are also known from Neolithic petroglyphs in Siberia and numerous finds of bear heads or headless bear figurines in the Arctic region. But none of these have been found in a ritual context like the two from Igloolik. Since the ritual with fireplaces appears to stretch across time and space, the researchers believe the finds are of far greater importance than previously thought. The bear figurines on the fireplaces are not only some of the few physical vestiges testifying to the Dorset culture’s view of life and death that archaeologist have ever come across. The figurines may also help explain an old mystery – why archaeologists only rarely find burial sites from the earliest settlers in Greenland and Arctic Canada. The archaeologist explains that when you look at archaeological finds across the world, there are so many overlaps where rituals transcend across cultures, time and space that there seems to be a connection. "It’s very strange! And many archaeologists will surely find it unreasonable to think this way as an archaeologist – because how can things be connected in this way?” says Appelt. ”I don’t have the answer. There’s no answer book here. But I think the two headless bear figurines prove that it’s not always right to view history from within the narrow confines of time, space and traditions. The next step for Odgaard, Appelt and their colleagues is to create an overview of Meldgaard’s records and publish the most important scientific findings. - The Dorset people in Greenland and Canada (c. 700 to 1,200 AD) is an archaeological term for a non-Inuit people group from Greenland. The Dorset culture preceded the Inuit culture in Arctic North America. Archaeologists believe the people migrated from Siberia and Alaska between 4,000 years ago and until the birth of Christ. Iniuit legends mention Tunitt (singular Tuniq) or Sivullirmiut (‘The first inhabitants’) as a people who were displaced by the Inuit. 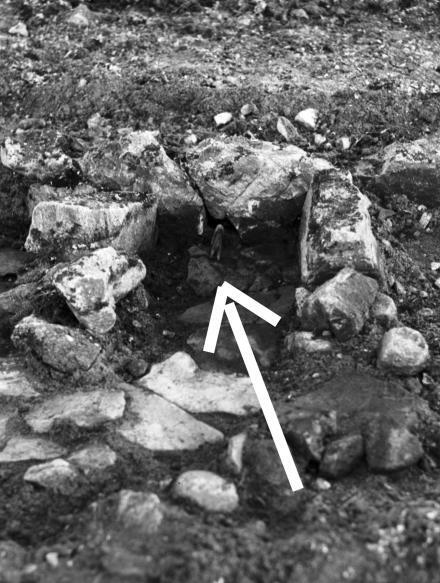 Archaeologists, however, doubt whether or not the Inuit met with the Dorset culture, although there is a general consensus that the two groups have lived in the same area for a period. Dorset culture became extinct around 1902 – probably as a result of a change in climate and living conditions, but also because they were ousted by the Inuit.